VF-154 arose when a Naval Reserve squadron was called to operational duty for the Korean war. The squadron was activated as VFB-718 upon the 1st of July 1946. Initially based at NAS Floyd Bennett, NY, their first mount was the F-6F Hellcat, soon followed by the F-4U Corsair. As well as changing aircraft, the squadron went through several designation changes, becoming VF-68A then VF-837. During their time as VF-837 the squadron moved from NAS Floyd Bennett to NAS Moffett Field, CA. VF-837 flew a combat cruise in the Korean war, flying off the USS Antietam (CV 36). By this point they had moved from the F-4U Corsairs to F9F-2 Panthers. VF-837 returned from their first cruise and started working up for a second. On the 4th of February 1953 while passing under the Golden Gate Bridge onboard the USS Princeton (CV 37) and on their way back to Korea, VF-837 was officially redesignated VF-154. After the Panther, VF-154 acquired the F-3J Fury, followed by the F-8 Crusader in 1957. The new F-8 persuaded VF-154 to change their insignia and name. The squadron was known as “The Grand Slammers” with the insignia of a flaming panther. 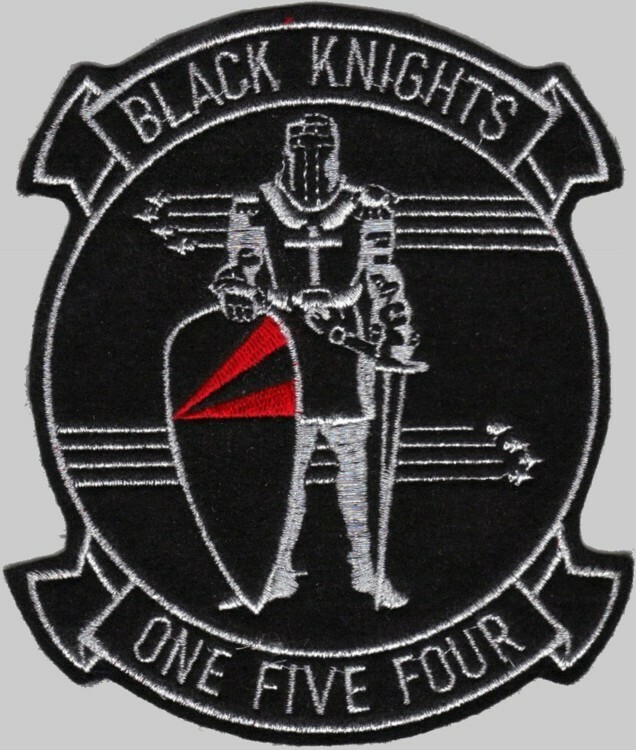 The new insignia, designed by Milton Caniff, creator of the Steve Canyon cartoon, was the Black Knight, armed with a sword to strike down the enemies of peace and justice and a shield to protect those unable to protect themselves. Their first combat deployment of the Vietnam war was in 1965, onboard USS Coral Sea (CV 43) as part of CVW-15. 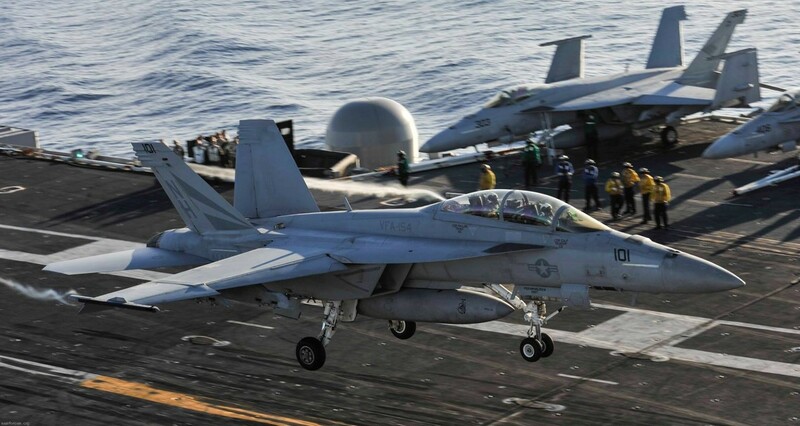 Their first combat strikes occurred on the 7th of February. After that, yearly combat cruises followed. The time between the first and subsequent cruises was put to good use as VF-154 transitioned to the F-4B Phantom II; at that time the standard aircraft for Naval fighter squadrons. As well as changing aircraft VF-154 moved from CVW-15, where it had resided since its establishment to become part of CVW-2, where it remained until 1980. After a second cruise onboard the Coral Sea the Black Knights shifted to the USS Ranger (CV 61), completing five further cruises to South East Asia. After the 1970 cruise VF-154 upgraded their aircraft again, this time gaining the F-4J version of the Phantom II. With this new aircraft the squadron’s final Vietnam tour took place. The timing saw VF-154 taking place in some of the last US Navy strikes of the war. 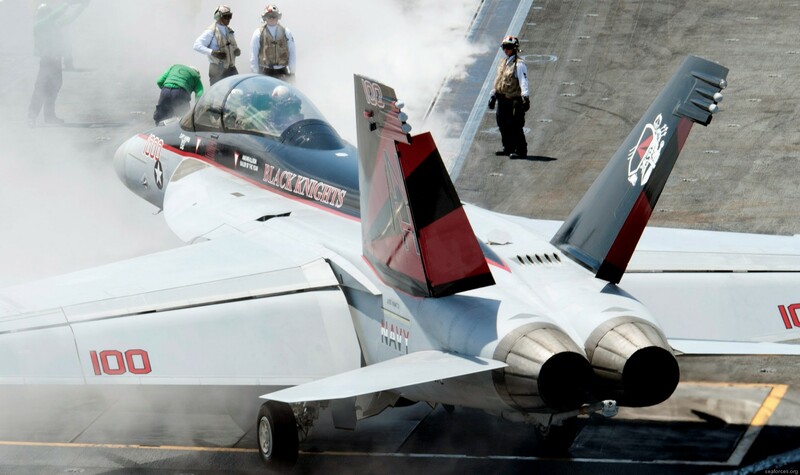 This last combat tour saw such a high standard from the Black Knights that they were awarded the Clifton Award, recognizing them as the best fighter squadron in the Navy. The Black Knights gained the last Navy version of the Phantom II, the F-4S, in 1979, but returned to the earlier F-4N version. Several cruises onboard the USS Coral Sea (CV-43) followed, as this carrier did not have strong enough decks to carry the larger, heavier F-14. Thus VF-154 (and sister squadron, VF-21), were among the last to convert to the F-14A. VF-154 finally transitioned to the F-14A beginning in October of 1983. Due to their late transition to the Tomcat the squadron received TARPS equipped F-14’s from the start. 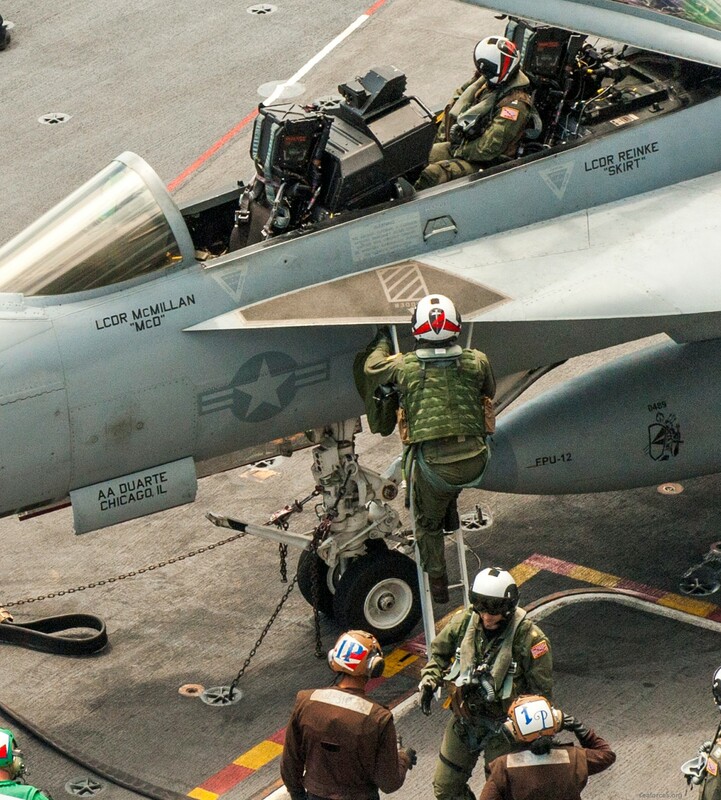 The first cruise with the F-14A was in 1985 onboard the USS Constellation (CV-64), as part of CVW-14. Several further cruises onboard ‘Connie’ followed, with one taking place in 1987. This eventful cruise saw VF-154 operating around the Persian Gulf, intercepting Iranian P-3F’s and conducting movements in the Gulf of Oman (at the so called “Gonzo” station). After the cruises onboard Constellation, CVW-14 moved to the USS Independence (CV-62) and it was as part of this team that saw VF-154 and VF-21 become the first F-14 squadrons to arrive in the Persian Gulf as part of “Desert Shield”. 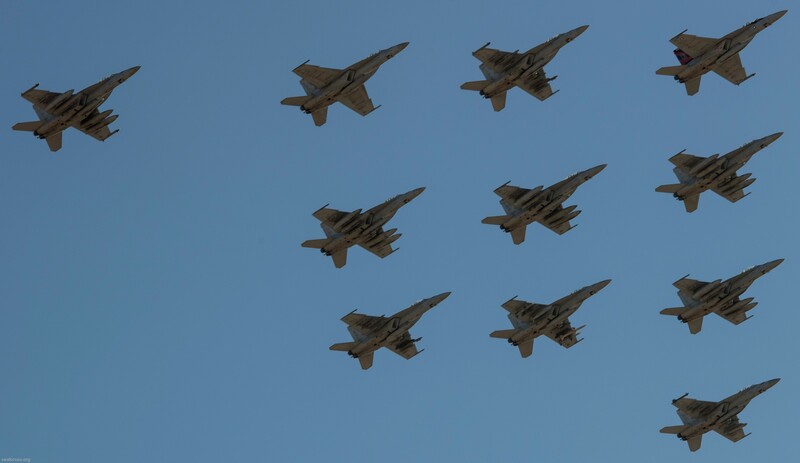 Due to taking part in “Desert Shield” and having been deployed for several months already VF-154 and Independence returned to the USA before Desert Storm began. The USS Independence moved in August 1991 to her home base at Yokosuka, Japan, to replace the USS Midway(CV-41). VF-154 stayed with the carrier for this, but moved from CVW-14 to CVW-5 and from NAS Miramar to NAF Atsugi, thus becoming the first forward deployed F-14 squadron. 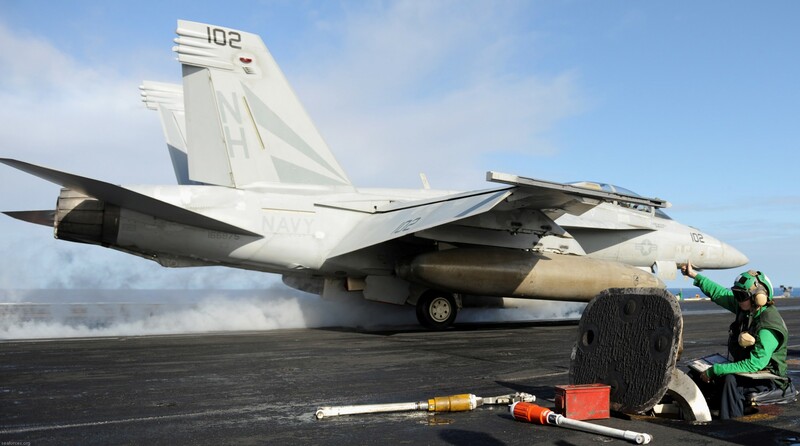 At the same time as joining CVW-5, VF-154 became the first F-14 squadron to deploy with an air-to-ground bombing capability. With the drawdown in F-14 squadrons during the mid-1990s, VF-154’s sister squadron, VF-21, was disestablished, leaving the Black Knights as the only F-14 squadron in CVW-5. 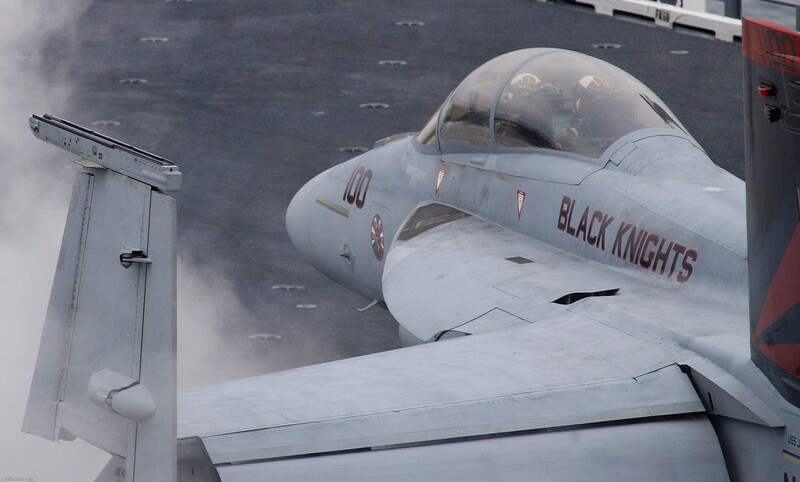 The Black Knights left the Independence and moved to the Kitty Hawk (CV-63) in the spring of 2000. At this point, VF-154 was flying the oldest Tomcats in the fleet off of the oldest ship in the Navy. 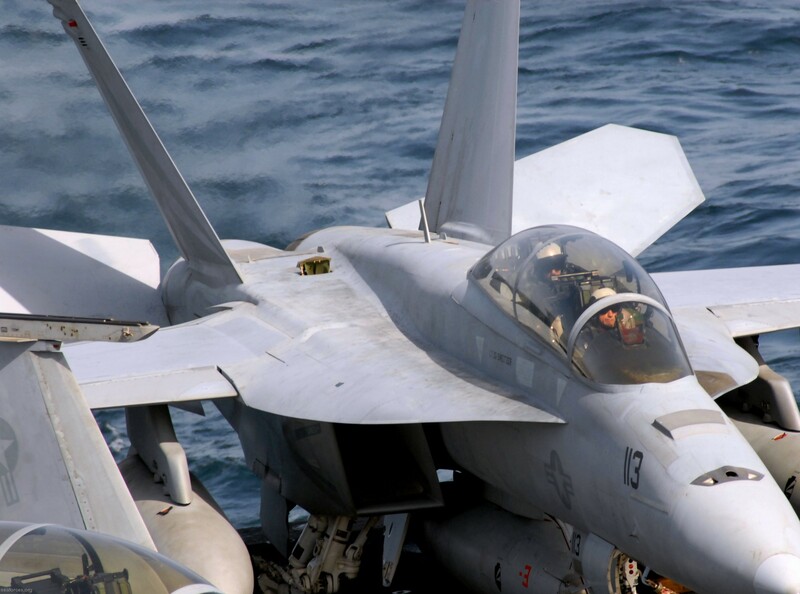 In January of 2003, VF-154 and CVW-5, were ordered back to the Kitty Hawk only a few weeks after completing a very successful fall at sea period. 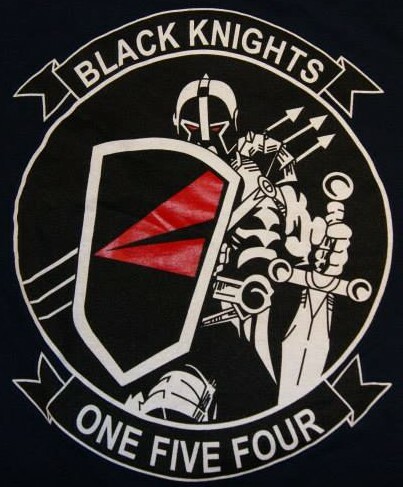 The Black Knights sailed west and into the Persian Gulf in preparation for Operation Iraqi Freedom. Due to the squadron’s excellent reputation, four jets were flown off the Kitty Hawk and operated from the beach during the war. 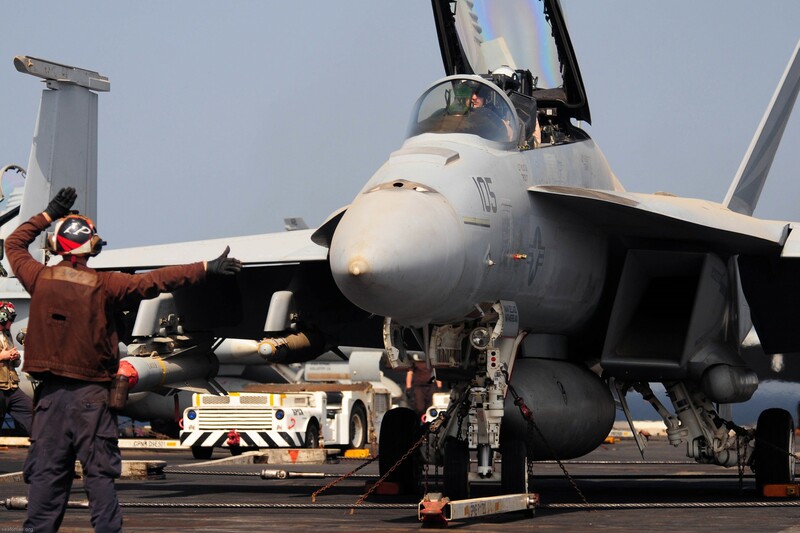 VF-154 dropped over 320 tons of ordnance and flew nearly 300 sorties during OIF. While forward deployed to Japan, the Black Knights would routinely go out to sea twice a year; once in the fall and once in the spring. Hong Kong, Guam and Singapore became very familiar ports and served as welcome breaks from pitching decks and the Kitty Hawk. In September of 2003 the Black Knights left Atsugi for the last time and ended their proud 13 years in Japan. All 11 jets made it across the Pacific and back into the break at Oceana, thus ending the Black Knights’ twenty years in the Tomcat. In October of 2003 VF-154 was redesignated VFA-154 and began transitioning to the Navy’s newest strike fighter, the F/A-18F Rhino. 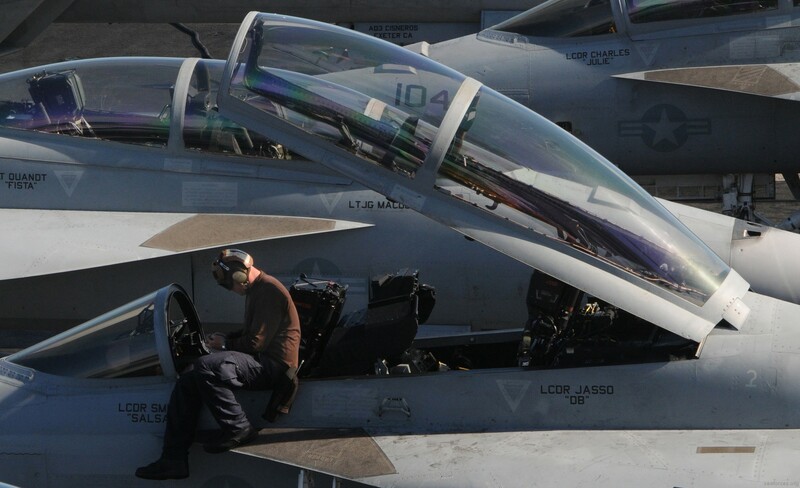 From October 2003 to June 2004, aircrew and maintainers of VFA-154 learned to fly and upkeep the new F/A-18F’s. 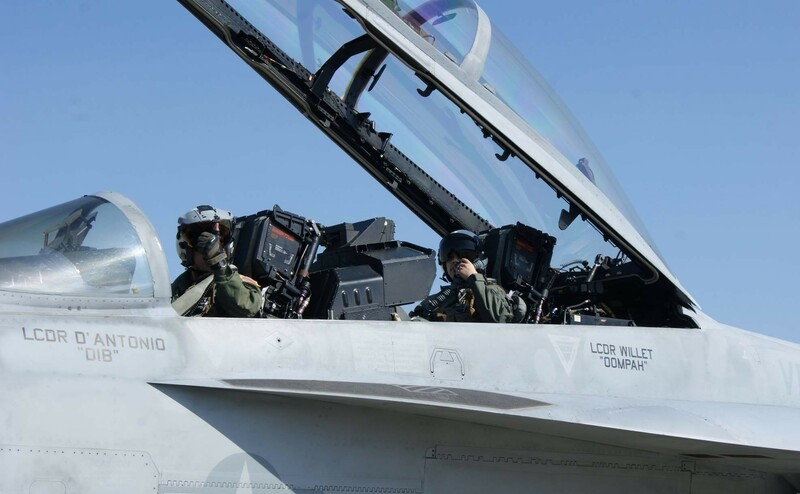 Only two weeks after achieving the “Safe for Flight” designation, the squadron once again found itself embarked, marking the start of a dynamic workup cycle in preparation for deployment. 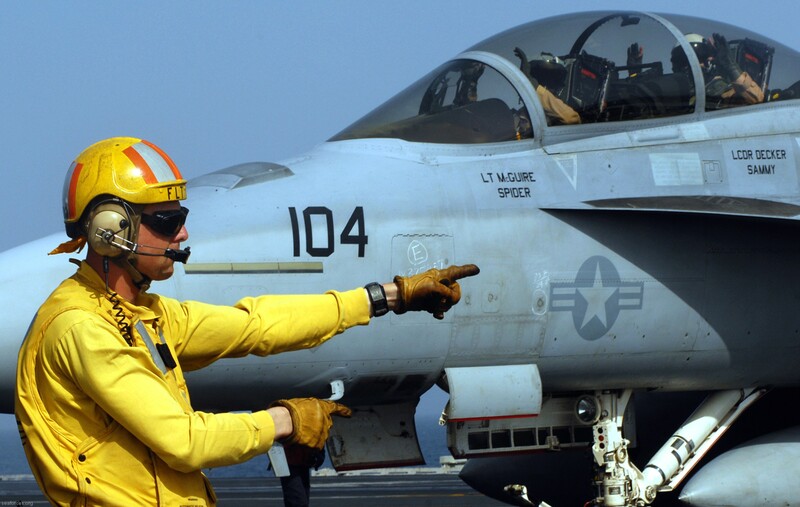 Throughout the rest of 2004, VFA-154 participated in demanding workup exercises to make sure aircrews and squadron personnel would be ready to fight with the new airframe. 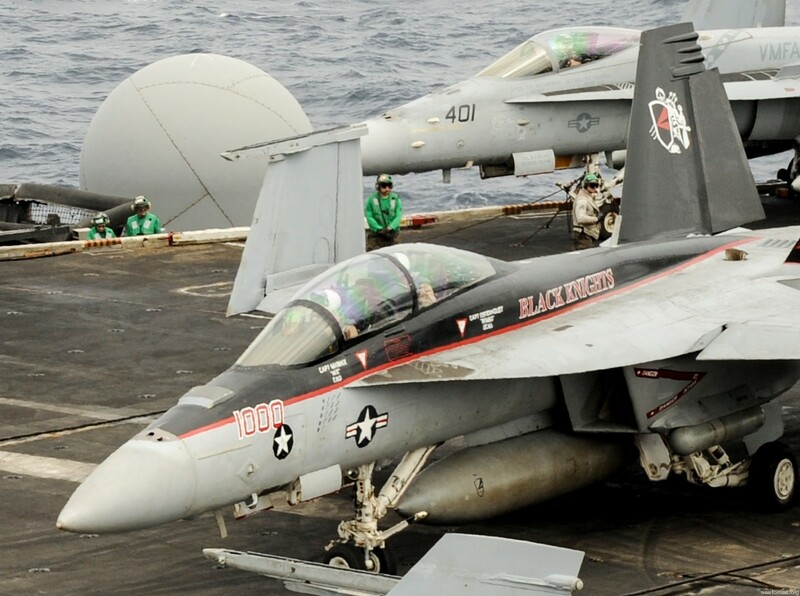 January 2005, Black Knights reported in January 2005 aboard the USS Carl Vinson (CVN 70) under the flag of Carrier Strike Group Three (CSG 3). 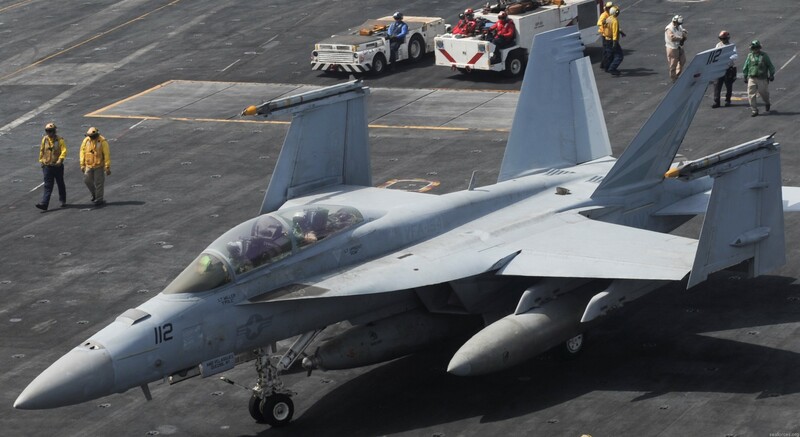 VFA-154 showed they were ready when on their first cruise in the F/A-18F they flew over 1,000 missions in support of Operation Iraqi Freedom (OIF). 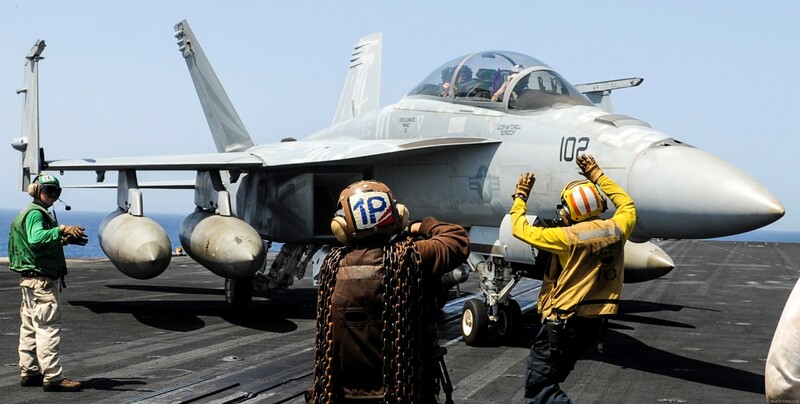 The squadron finished their round-the-world cruise as they departed the USS Carl Vinson in Norfolk, VA. Arriving home on 31 July 2005, the Black Knights spent the rest of the year concentrating on unit level training. 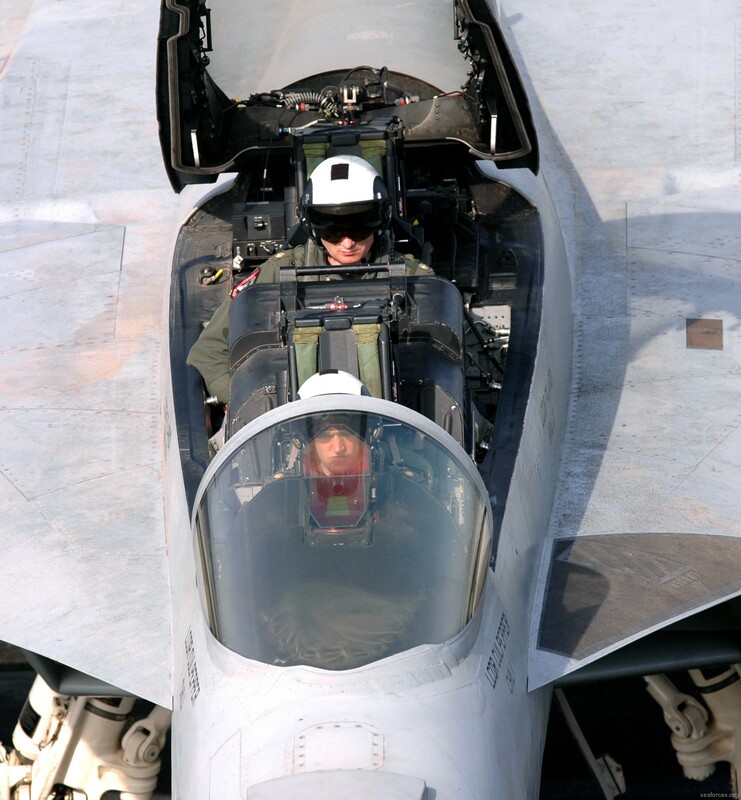 The beginning of 2006 presented the second round of workups for VFA-154 in the Rhino. 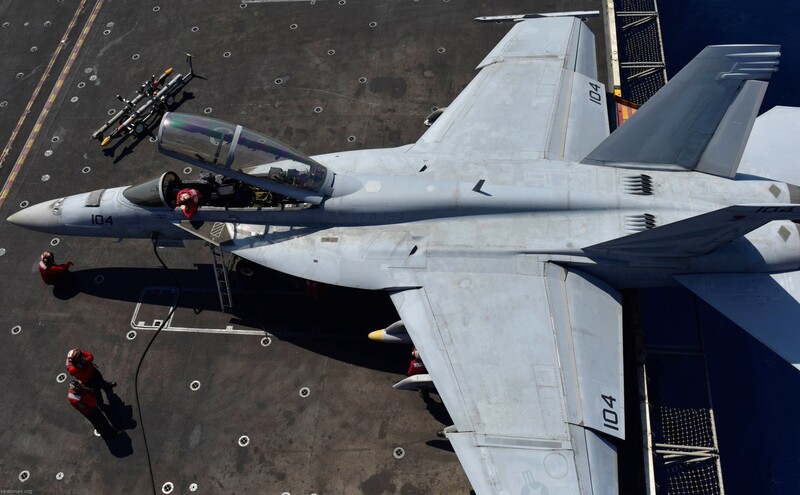 Demanding schedules had the squadron traveling from NAS Lemoore, to NAS Fallon, and back once again to sea, only now aboard the USS John C. Stennis. 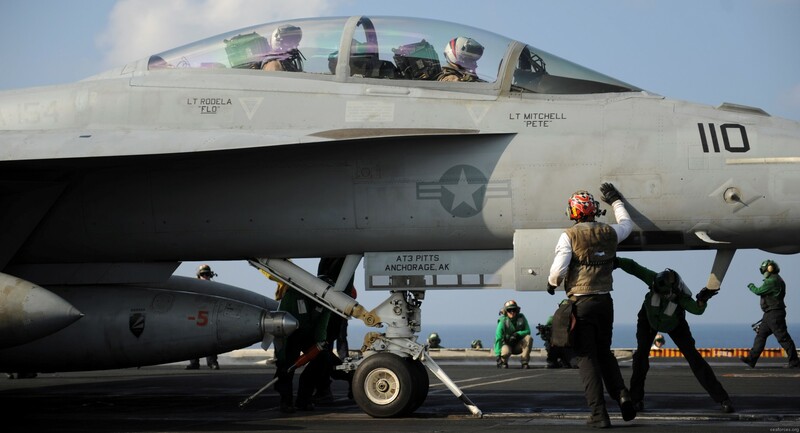 In January 2007, VFA-154 departed on their second cruise, this time in support of Operation ENDURING FREEDOM (OEF) and OIF. 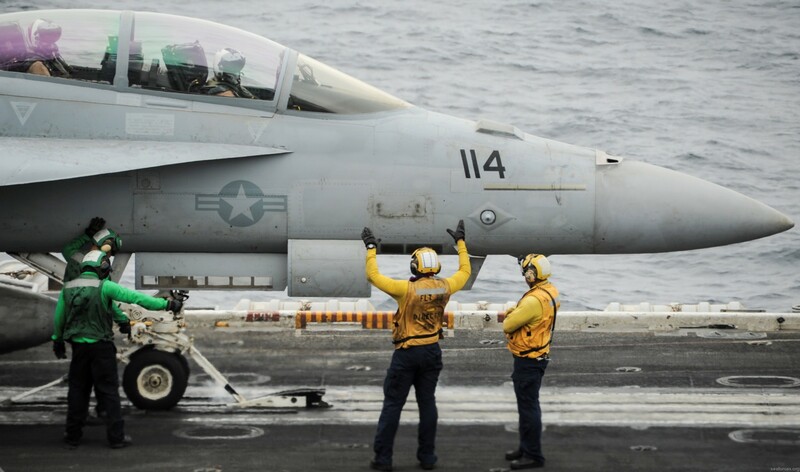 Exceeding their previous operational success, the second F/A-18F deployment demonstrated the aircraft’s increased combat effectiveness while employing more than 40,000 pounds of ordnance supporting coalition ground forces in Iraq and Afghanistan. 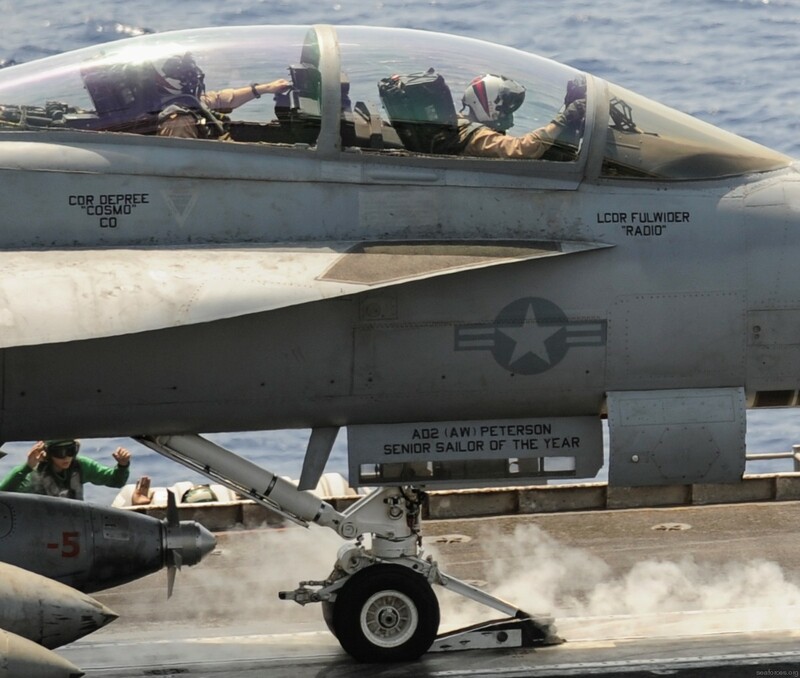 In June of 2010, the Black Knights embarked aboard the USS RONALD REAGAN (CVN 76) with Carrier Air Wing FOURTEEN to take part in the multi-national Rim of the Pacific (RIMPAC) exercise. 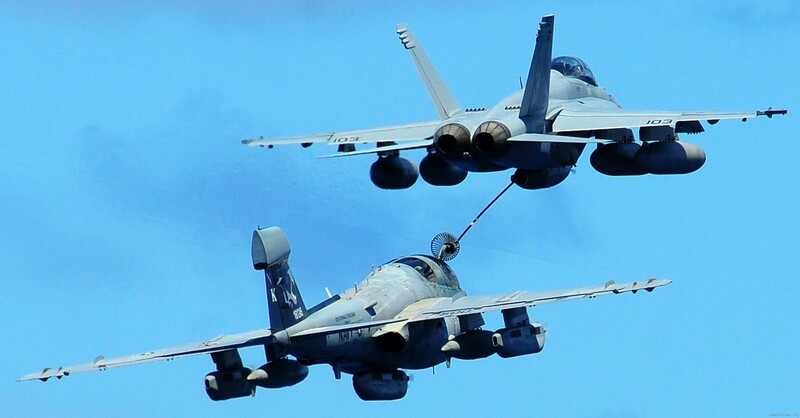 RIMPAC included both air-to-air and air-to-surface live-fire exercises as well as missions designed to sink target vessels. 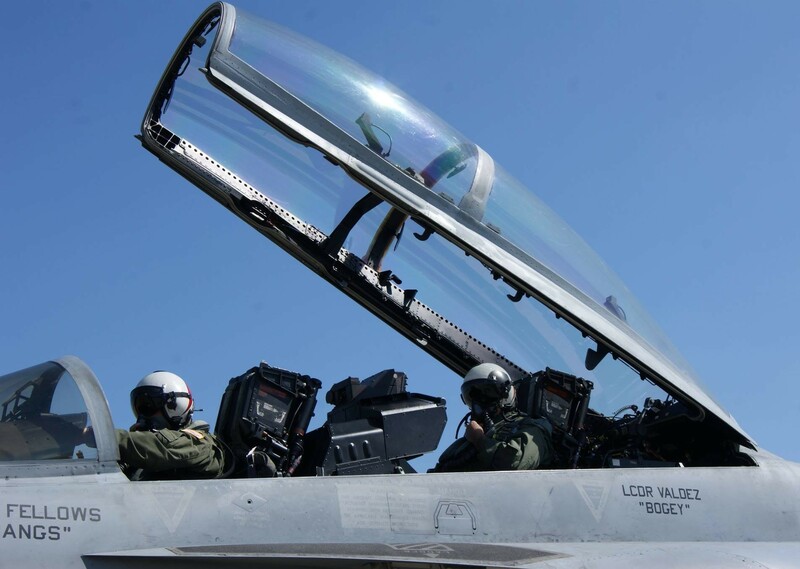 The live ordnance employed by the Black Knights included over 85,000 pounds of general purpose and laser-guided bombs, thousands of rounds of 20mm ammunition, a High Speed Anti-Radiation Missile (HARM), and four AIM-9 Sidewinder air-to-air missiles. Following RIMPAC, the Black Knights continued a challenging set of workups moving to NAS Fallon, NV for Air Wing Fallon, and then back to the REAGAN for COMTUEX. 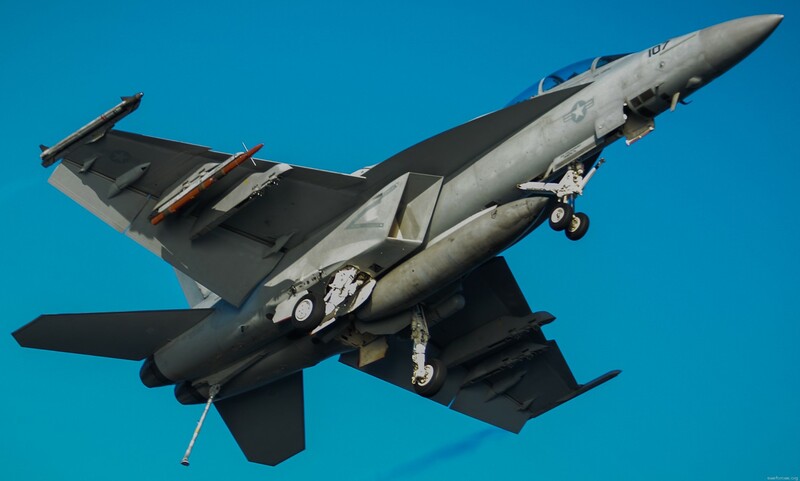 At the completion of COMTUEX, VFA-154 had flown more than 380 sorties including over 650 flight hours, and delivered over 50,000 pounds of ordnance. 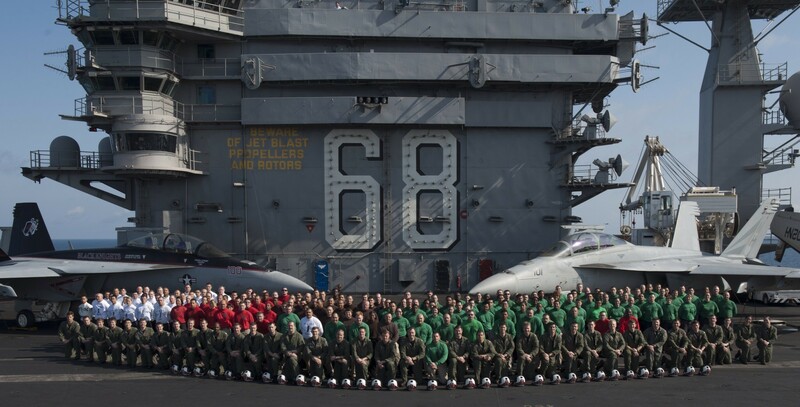 After the holidays, the squadron deployed aboard the REAGAN in February 2011. 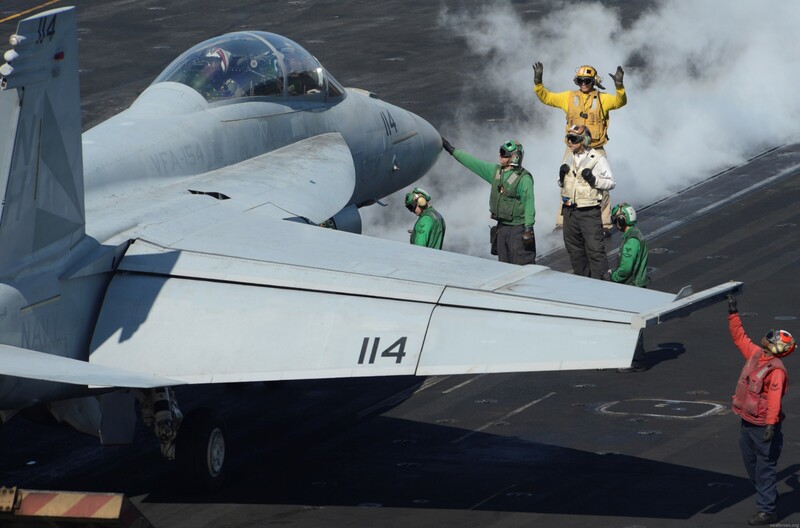 Originally planning to participate in an exercise with the Republic of Korea, the carrier was headed for the Sea of Japan when a magnitude 9.0 earthquake and subsequent tsunami devastated the eastern coast of the Japanese mainland. Reacting quickly, the ship raced to a position northeast of the city of Sendai and began humanitarian assistance and disaster relief efforts. The effort was dubbed Operation TOMODACHI, or “friendship” in the Japanese language. 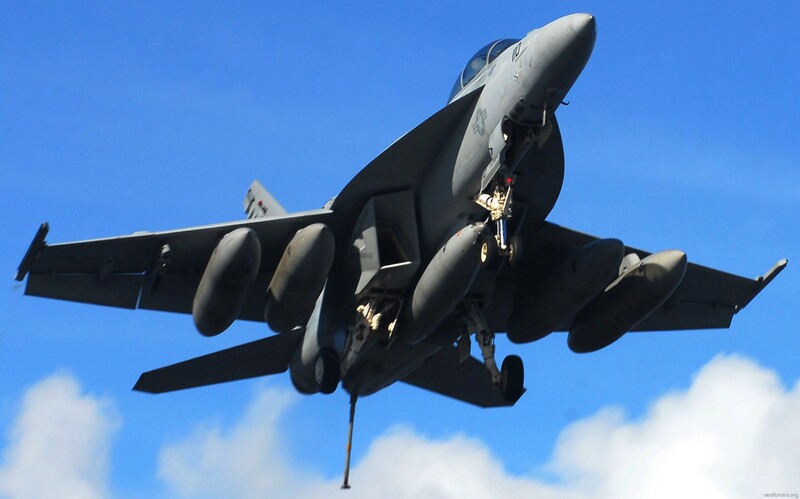 VFA-154 launched multiple reconnaissance flights over the area affected by the earthquake and tsunami. Utilizing their advanced sensors, Black Knight aircraft were able to accurately map the devastation and identify previously un-located groups of survivors. 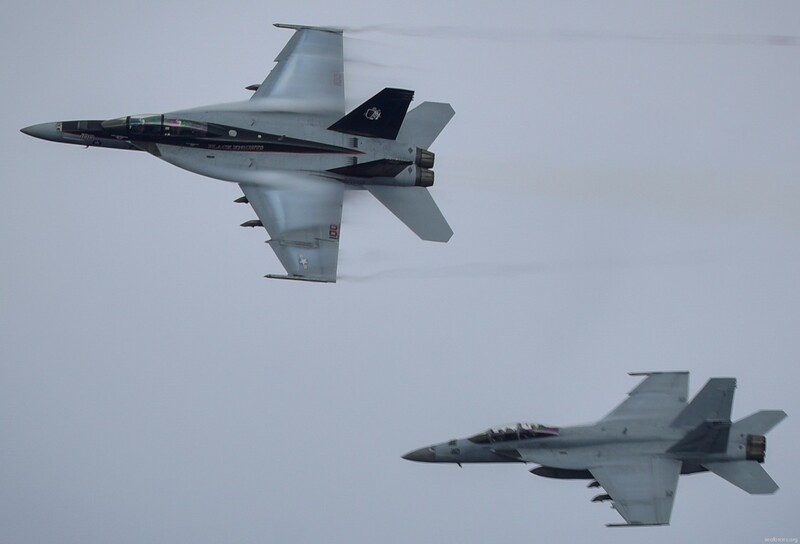 All told, reconnaissance flights by VFA-154 turned up 10 refugee gatherings that were previously unknown to the Navy and the Japanese government. 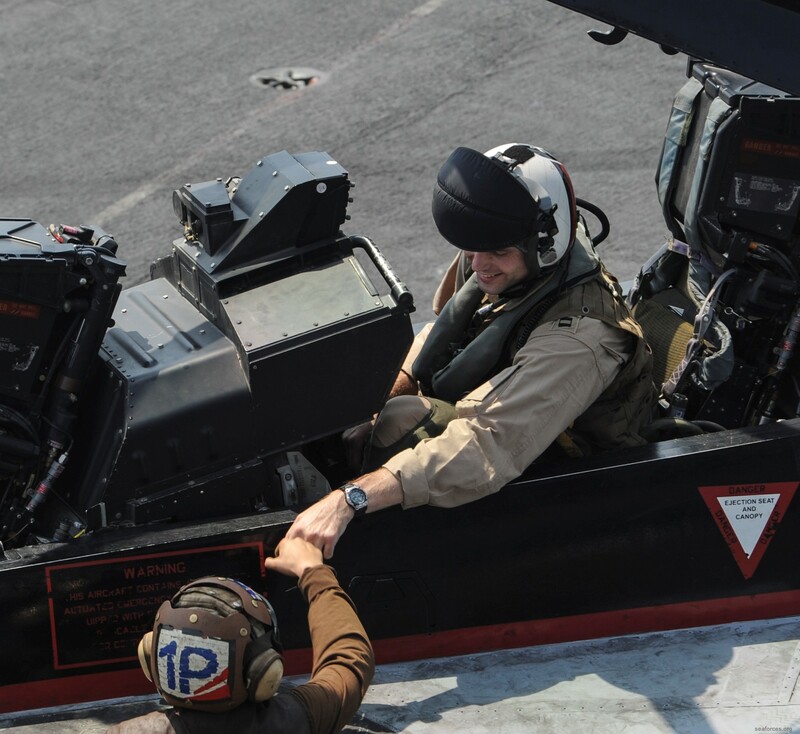 Following disaster relief operations, the ship continued west into the Arabian Sea in order to launch combat sorties in support of Operation NEW DAWN and OEF. 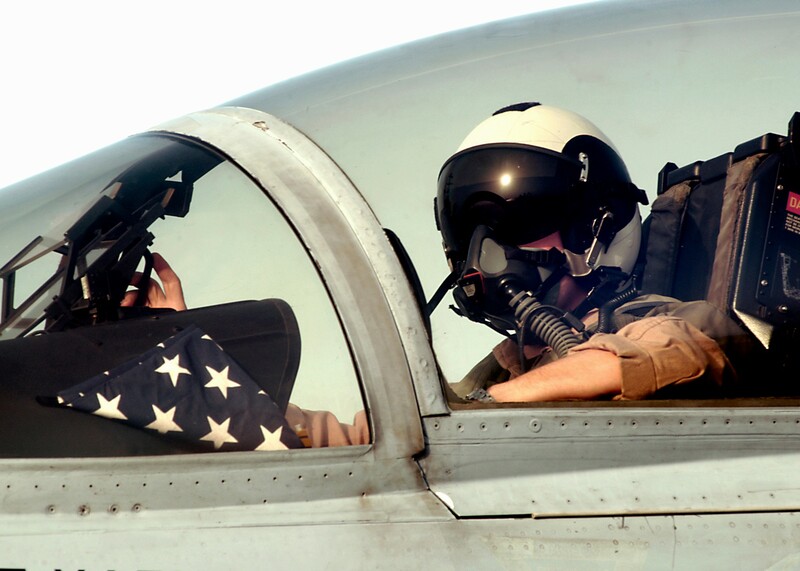 In OEF, the squadron often flew missions supporting USMC ground units in the critical Helmand Valley region. Black Knight aircraft also roamed north supporting units near Mazar-e-Sharif, as well as east all the way up to the Pakistan border. 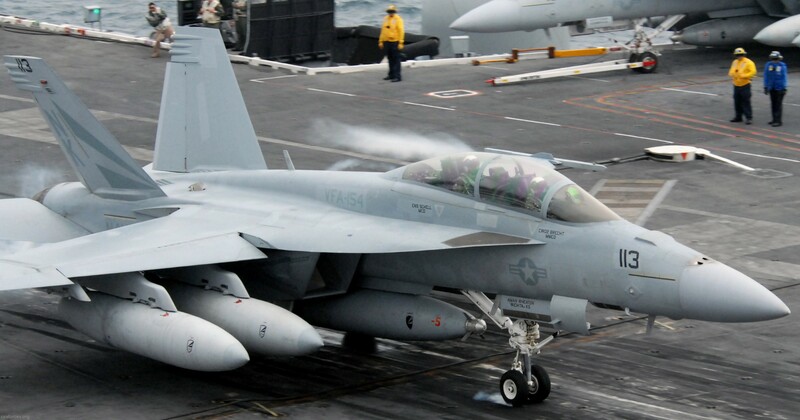 All told, VFA-154 dropped 6800 pounds of ordnance, more than half of the air wing’s total. Black Knights also fired well over 1500 rounds of 20mm ammunition in strafe attacks. In July 2012, the Knights departed Lemoore once again to participate in Rim of the Pacific (RIMPAC) 2012. The exercise is the world's largest international maritime exercise. RIMPAC provides a unique training opportunity that helps participants foster and sustain the cooperative relationships that are critical to ensuring the safety of sea lanes and security on the world's oceans. RIMPAC 2012 is the 23rd exercise in the series that began in 1971. Following RIMPAC 2012, the Black Knights detached to NAS Fallon, NV for Air Wing Fallon. This detachment was no stroll in the park as exceptionally high demands were placed on the Black Knight team. 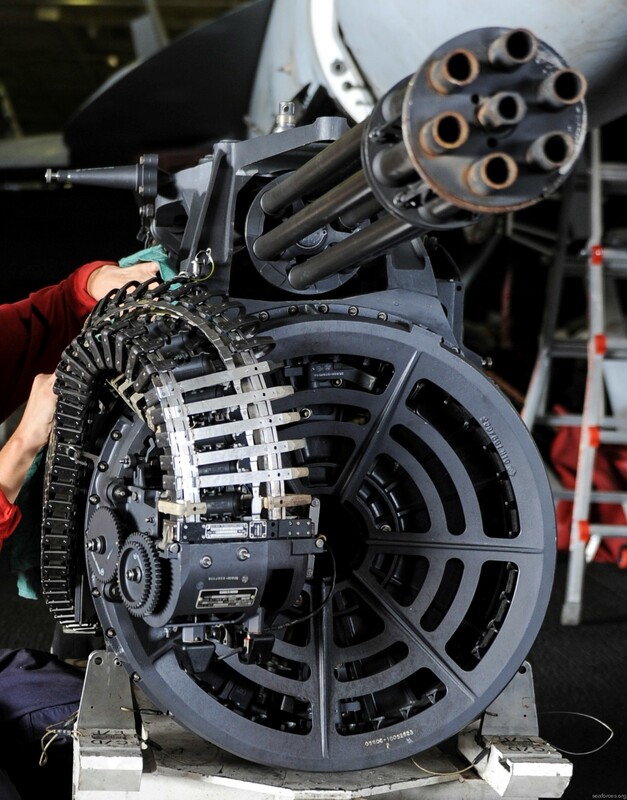 In spite of this, the Knights rose to every challenge and performed with high marks, as is tradition, employing over 73,000 lbs of ordnance and expending over 5,500 rounds of the 20mm. However, the most glaring test given to the Black Knight team was the addition of 30 sorties that were flown in less than a month. 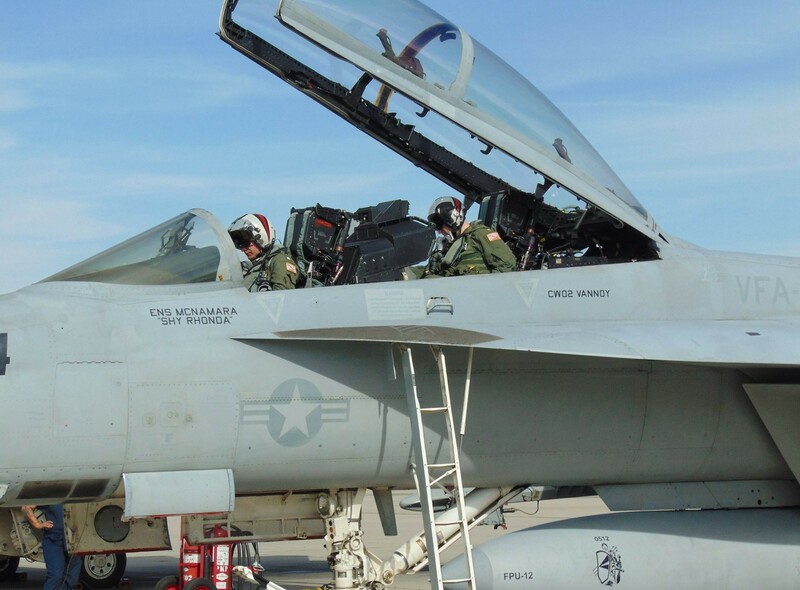 These additional 30 sorties allowed the Air Wing to successfully meet its goal of 100 percent event completion. As workups continued, the Knights left again in early October. 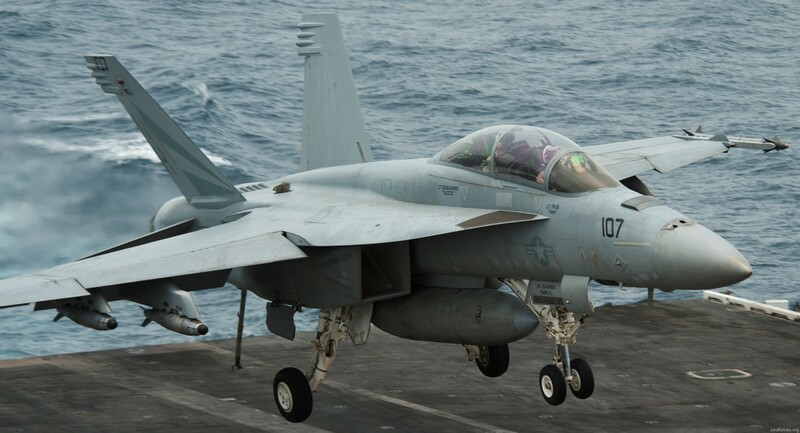 VFA-154 and CAG-11 began working on their blue water certification. 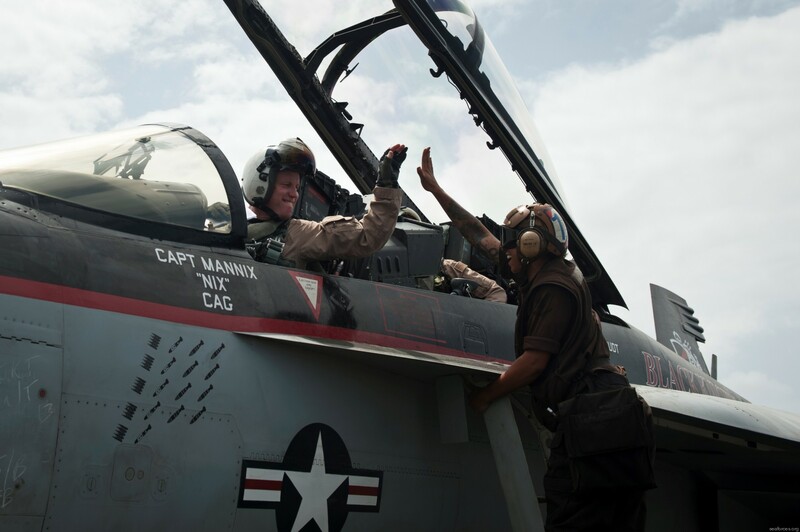 Upon the completion of COMPTUEX, Commander Carrier Air Wing Eleven, Captain Greg Harris, awarded VFA-154 as the Top Hook squadron for the preceding ten months. 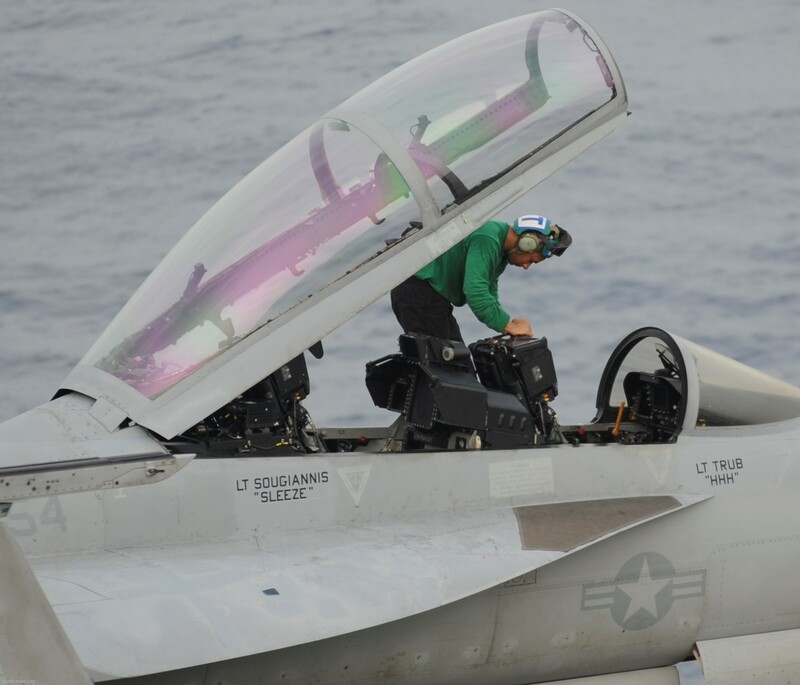 This award encompassed Flight Deck Certification, TSTA/Rim of the Pacific Exercise (RIMPAC), as well as COMPTUEX/JTFEX, and resulted in more than 650 traps for the squadron. Top Hook is presented to the squadron with the highest landing grades and boarding rate based on their carrier landings. What was most impressive about the Knights earning the Top Hook award was that they also led the way in every other category, including most sorties flown, ordnance employed and hours executed. Additionally, this was the first time in CVW-11’s distinguished history that a two-seat Rhino squadron earned the “Top Hook” title. In March 2013, the Black Knights took part in A/A training with NWSEP (Navy Weapons Systems Evaluation Program) at Tyndall AFB, Panama City, FL earning the coveted “Boola Boola” Award for proficiency in A/A missile employment. 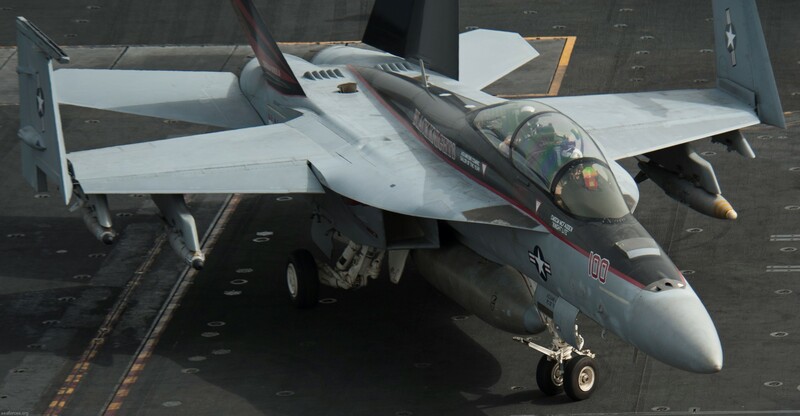 With the completion of COMPTUEX, JTFEX, and SUSTEX, the Black Knights departed NAS Lemoore in April 2013 to deploy on USS NIMITZ (CVN 68) in support of OPERATION ENDURING FREEDOM. 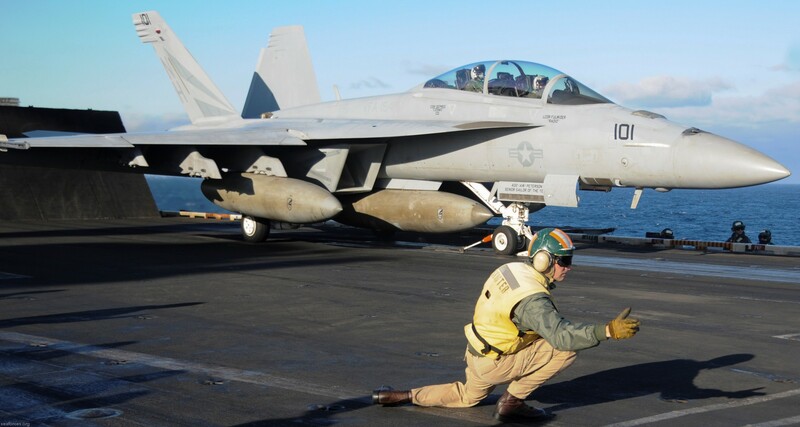 During deployment, the Black Knights were awarded the 2013 Commander Strike Fighter Wing, U.S. Pacific Fleet (CSFWP) "LTJG Bruce Carrier" and the CVW-11 "Golden Wrench" Awards for excellence in maintenance while executing over 2,100 sorties and more than 6,000 Class A mishap-free flight hours. 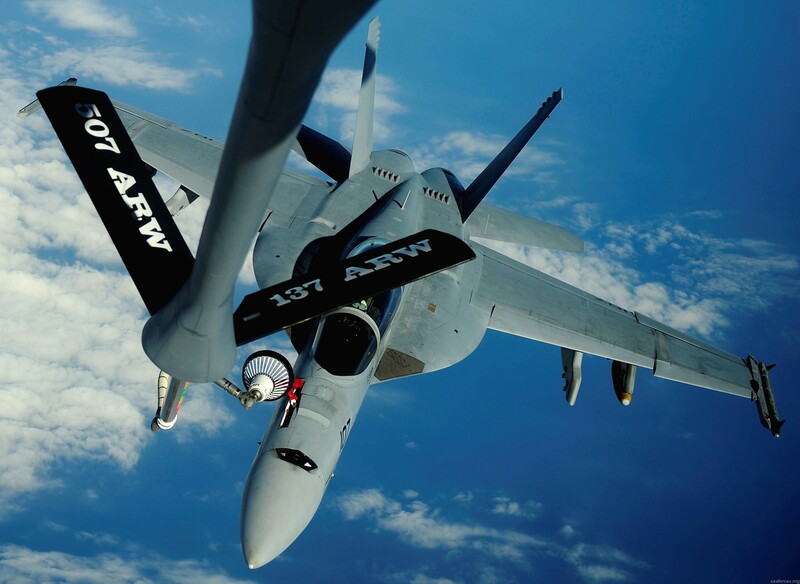 The Black Knights led CVW-11 with over 75% of all munitions expended in support of coalition forces, to include 13 Joint Direct Attack Munitions (JDAM) an over 1,700 rounds of 20MM ammunition during the 2013 WESTPAC combat deployment. When the U.S.S. 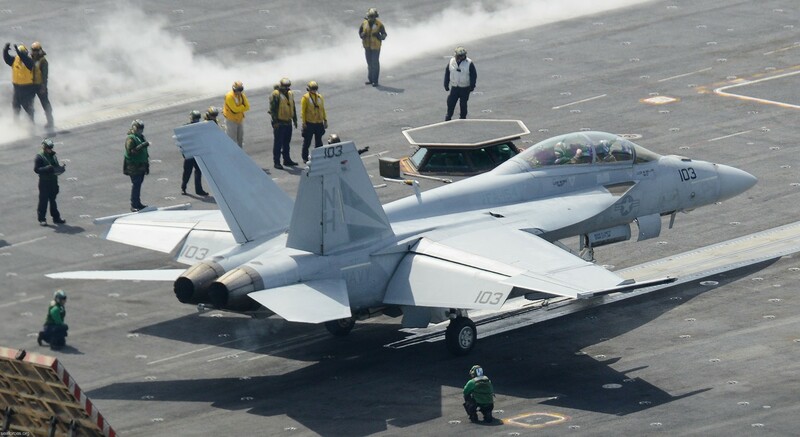 NIMITZ (CVN 68) was tasked for potential contingency operations in the Red Sea, the Black Knights led the charge in testing the limits of the F/A-18F aircraft and weapons systems maximizing CVW-11's air-to-surface strike capability while providing senior leadership realistic expectations to the tactical, strategic, and political situation. 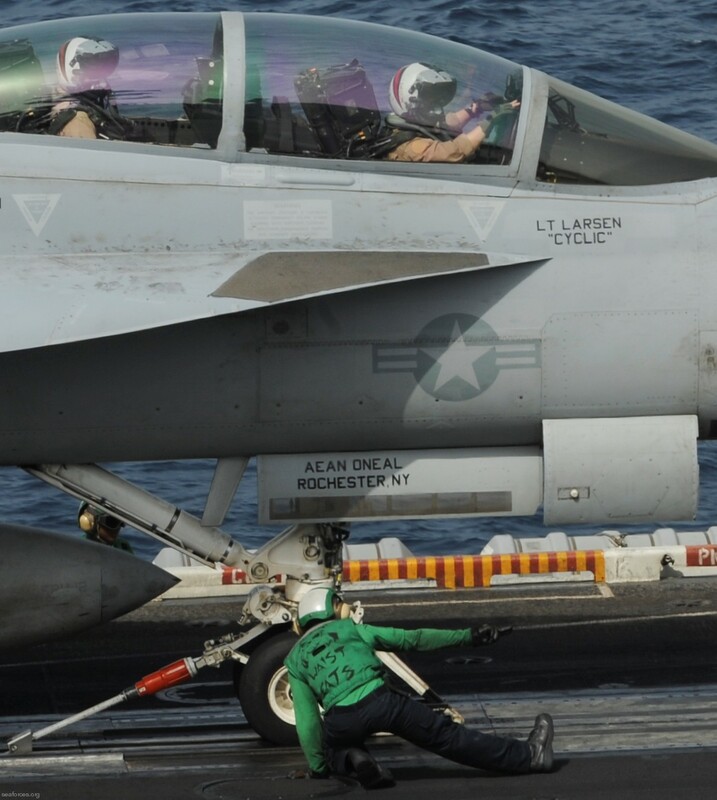 2015 was filled with operational detachments to include Elmendorf, Alaska; Las Vegas, Nevada; Key West and Tyndall, Florida; as well as a carrier and deck qualification onboard the USS Reagan and TGEX on the USS Nimitz. Following a four day port call in Chennai, India, the Black Knights participated in the at-sea phase of Malabar 17. Malabar 17 is the latest in a continuing series of exercises between the Indian Navy, Japan Maritime Self Defense Force and U.S. Navy that has grown in scope and complexity over the years to address the variety of shared threats to maritime security in the Indo-Asia Pacific. The missions executed over the past few days increase the interoperability between the three nations, which makes it easier for the US to work with Indian or Japanese units. While in port, members of the participating navies met with their counterparts to compare experiences and share lessons from their varying military careers. 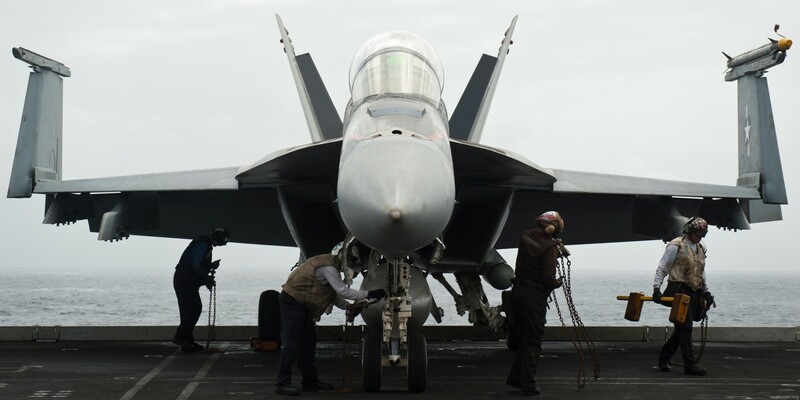 This year's exercise marked the first time that the US, India, and Japan sent a carrier to participate in the exercise. The Nimitz was joined by the Indian carrier INS Vikramaditya as well as the Japanese helicopter carrier JS Izumo. In the Bay of Bengal, the three navies practiced high-end warfighting skills, maritime superiority and power projection to include carrier operations, maritime patrol and reconnaissance operations, surface and antisubmarine warfare, medical operations, damage control, explosive ordnance disposal (EOD), helicopter operations, and visit, board, search and seizure (VBSS) operations. The Black Knights conducted missions with the Indian MiG-29K that culminated in a Photo-Ex. 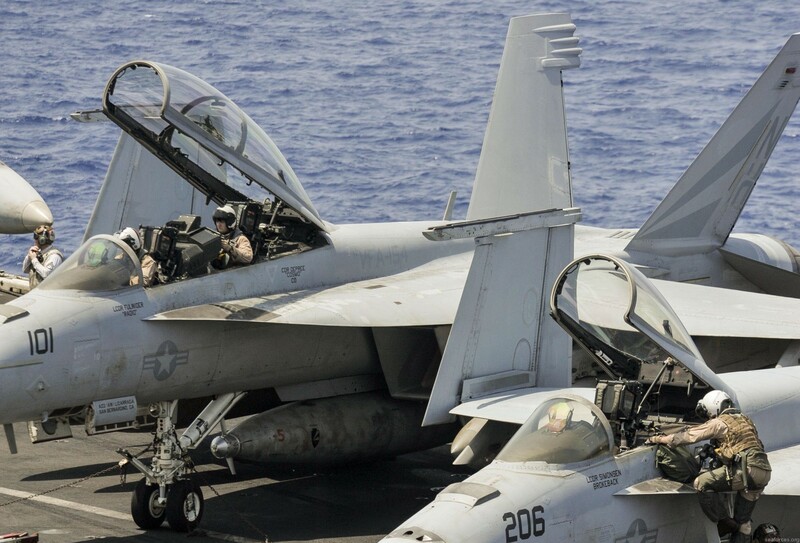 At the conclusion of Malabar 17, the Black Knights and the rest of the Nimitz Carrier Strike Group continued their journey west towards the Arabian Gulf. After departing the Bay of Bengal the Black Knights transited through the Strait of Hormuz and into the Arabian Gulf. 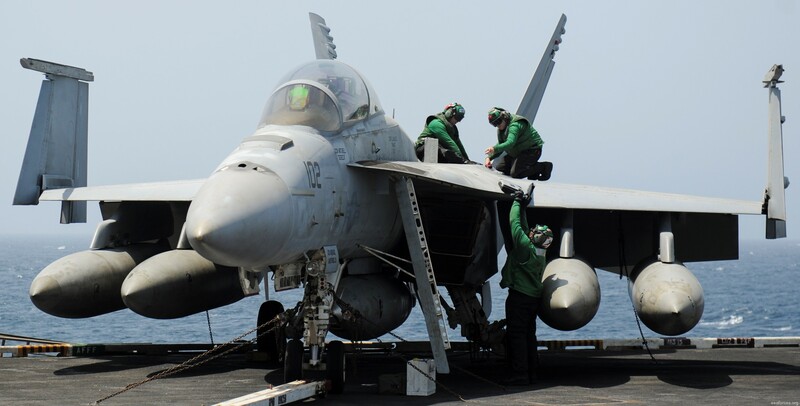 Working in heat indexes in excess of 150 degrees Fahrenheit, the Black Knight sailors started launching aircraft in support of Operation Inherent Resolve. 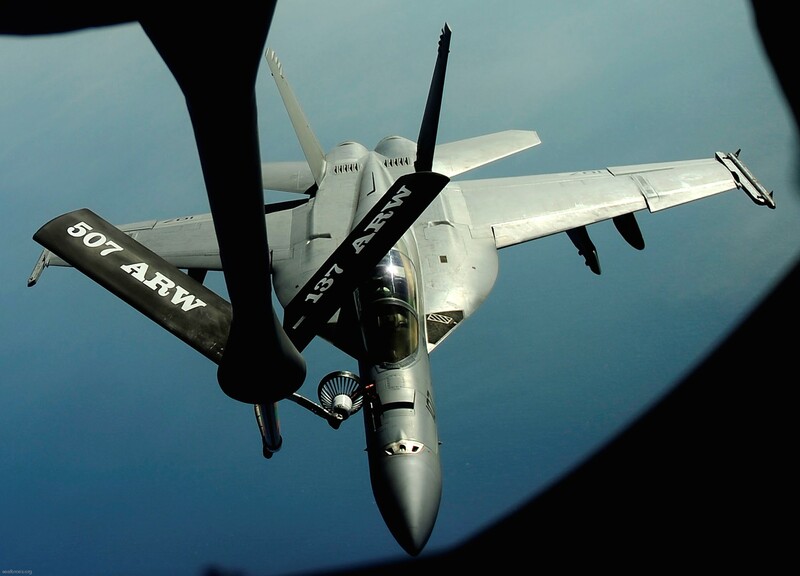 Black Knight aircrew flew both defensive counter air and close air support missions to ensure safety and freedom of movement for Coalition forces on the ground. One month into operations in the gulf, the Black Knights were awarded the CVW-11 "Top Hook" award for the first line period. 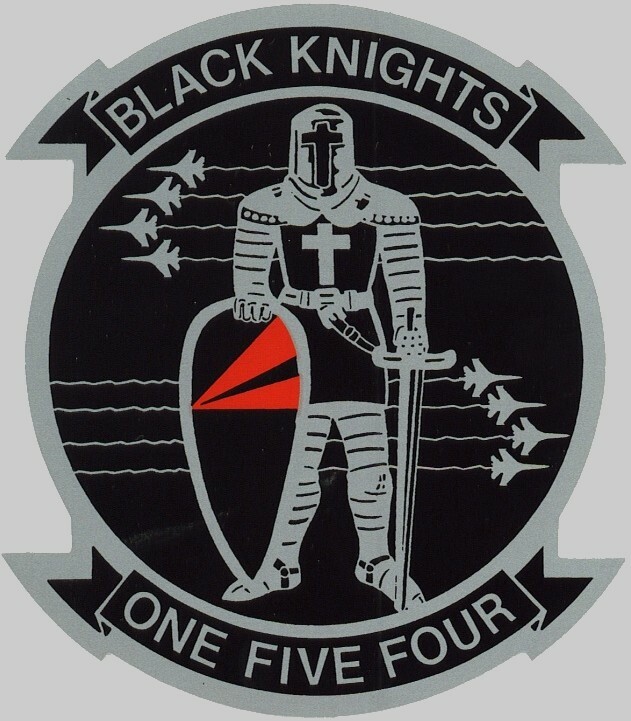 The BLACK KNIGHTS flew over 2,400 flight hours, expended 219,500 pounds of precision guided munitions, and employed 722 rounds of 20 millimeter ammunition to defend Coalition forces engaged in direct combat with the enemy. 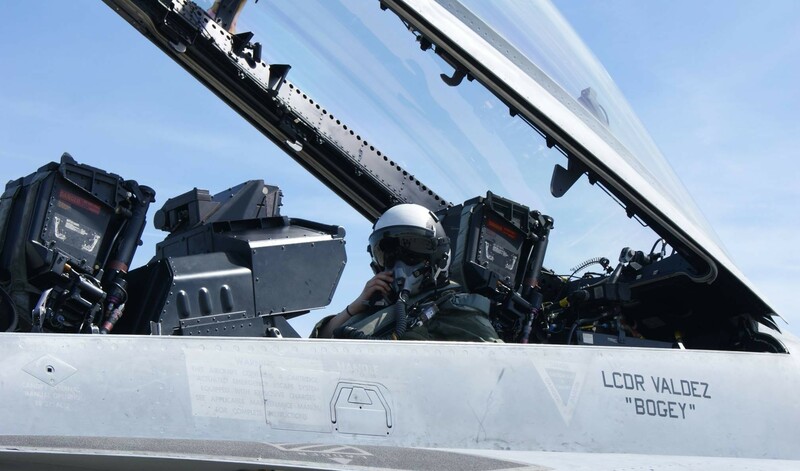 The air power delivered by the BLACK KNIGHTS and Carrier Air Wing 11 enabled friendly forces to liberate the ancient cities of Raqqah, Mosul, Tal Afar, Hawijah, Anah, and Rayhanna from the tyrannical hands of the Islamic State of Iraq and Syria (ISIS). 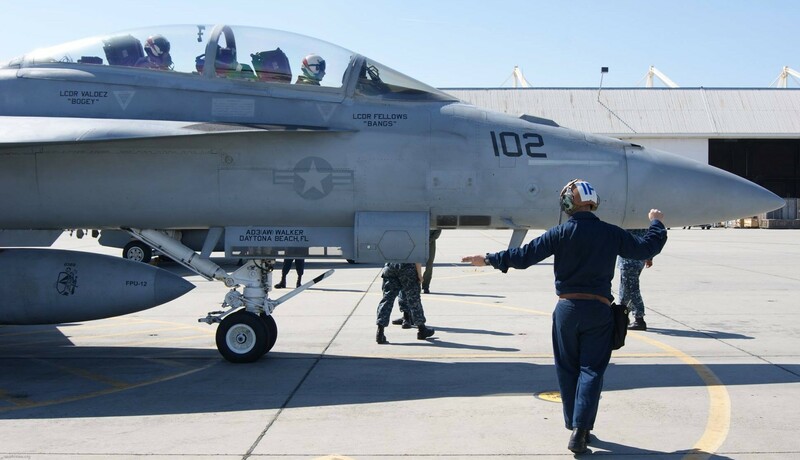 Returning from deployment, the squadron helped pioneer the new aircraft readiness and maintenance improvement program. 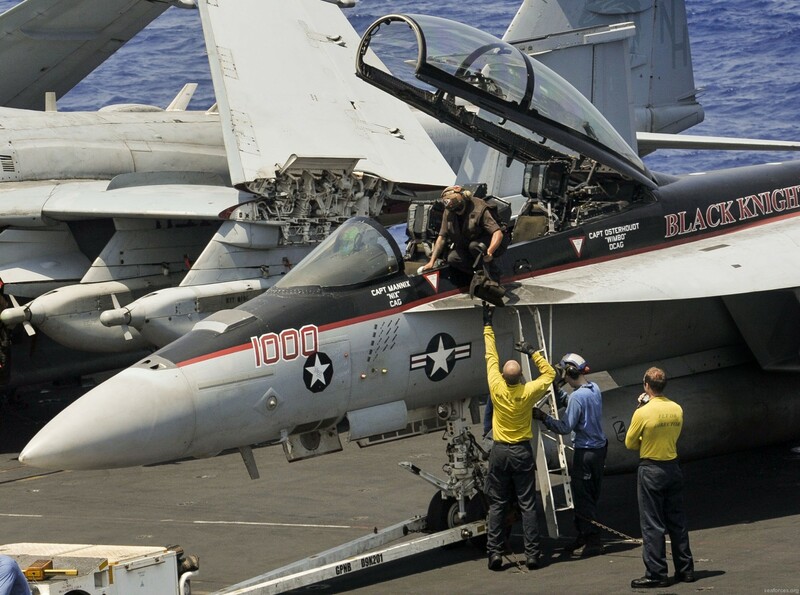 The Black Knights were the first squadron to participate in many new maintenance training programs, providing valuable feedback to improve the program and extend the service life of critical Navy Strike Fighter assets. 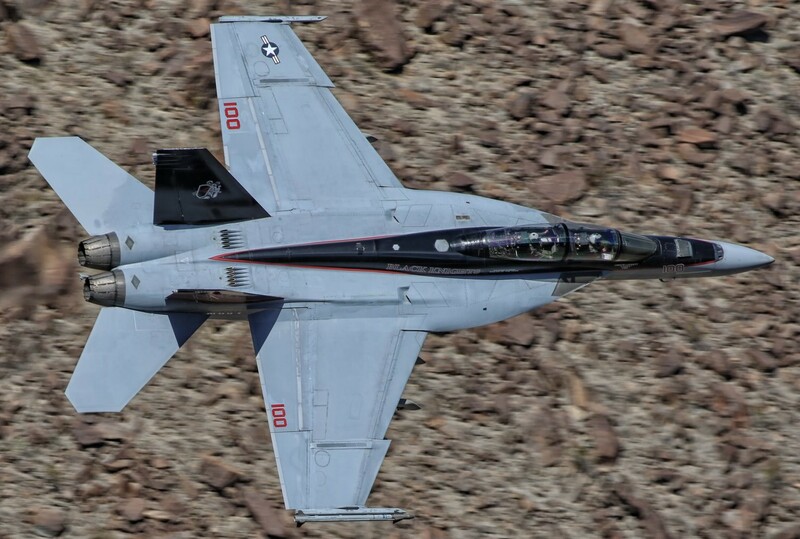 As the Black Knights continue to prepare for their next deployment, they detached to NAS Fallon, supporting joint operations for the Neptune Hawk/Falcon exercise. 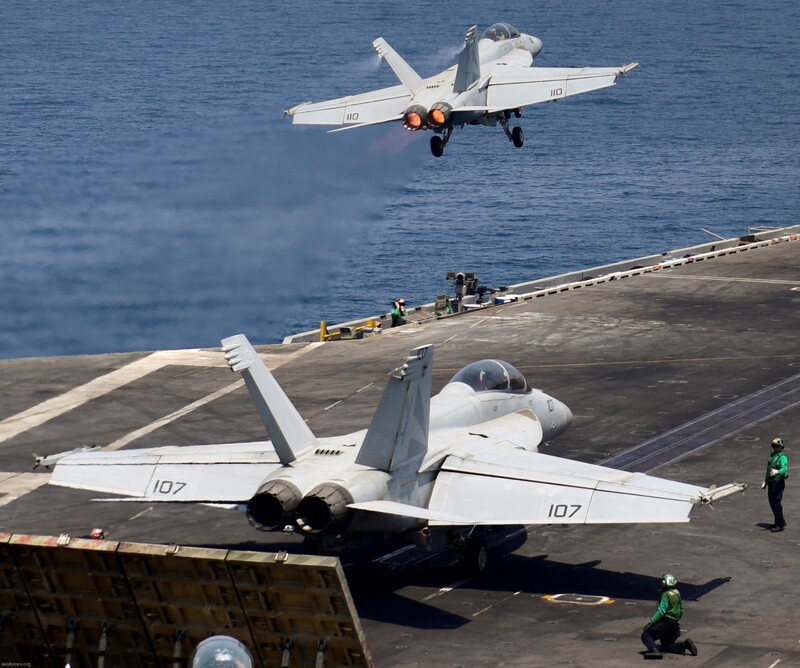 Following the Fallon detachment, the squadron spent an at-sea period aboard USS Stennis (CVN-74) updating both day and night carrier landing qualifications.